A few days, the controversial Mathira informed the media about her marriage and after a week she broke the news of becoming a mommy soon! In her statement, she said that “I can’t disclose the name of my husband, he lives in abroad and doesn’t belong to showbiz industry”. After staying in hospital for three days, today mathira has been blessed with an adorable baby boy. 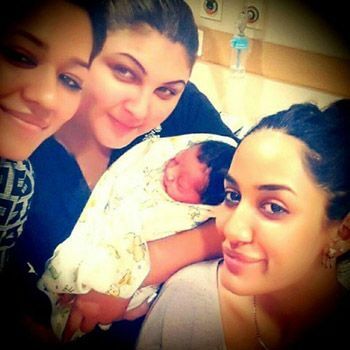 Here are the pictures of Mathira with her baby, friends and family! How Is It Possible That Rob & Chyna’s Long National Nightmare Is Only A Year Old? Will “dumb And Dumber” Still Be Funny Twenty Years Later ? Does This Photo Make A Liar Out Of Halle Berry?